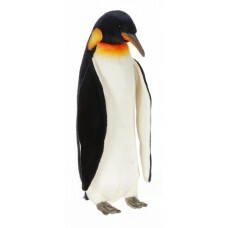 This Hansa stuffed animal is a realistic rendition of a real Emperor Penguin. The penguin is a flightless aquatic bird that can be found in the southern hemisphere. Most have a white breast and black back and head. Some species of penguins can have red, orange, or yellow patches on their head and neck. They feed on fish, cuttlefish, crustaceans, and other small sea animals. Most lay 2 eggs, but incubation varies among species.